Creative inspiration is a necessary ingredient for every part of life, but certainly needed when educating and inspiring children. We need to be creative in our approach so our students are engaged and we need to continually reinvent the lesson to maintain both their level of interest and our own. So where do we find our creative inspiration? Our Happymess approach is usually to look at each lesson as part of an inter-disciplinary component. We ask ourselves, "How does this one piece of learning fit into the giant puzzle of knowledge?" I typically try to find at least 3 different disciplines related to each individual subject. I try to surround our nugget of factual study with small pieces of art, history or literature that will make the "fact" seem more "real" to our aspiring student. For example, when studying math we ask ourselves, "Why is this really necessary? Who has used this knowledge in the past?" "Why might we be interested in knowing this in the future?" These type of questions quickly lead us to a study of history, both ancient and modern. 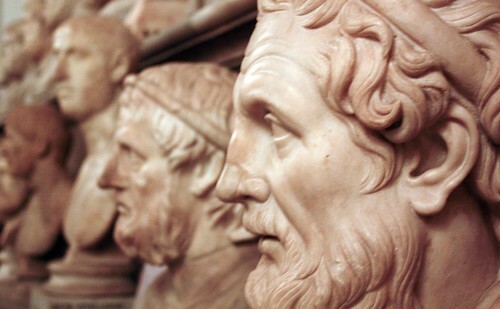 We can look at the ancient Greek philosophers and mathematicians and learn how they studied the general principles of the world. We can study the lives of Euclid and Pythagoras and learn about the Euclidean algorithm for determining the greatest common divisor, or in Saxon Math terms, the greatest common factor (GCF). We study Pythagoras' theorem for determining the hypotenuse of a right triangle: a squared + b squared = c squared. We see immediately that these are not merely formulas to be memorized. These are scientific principles that govern our natural world. These principles were observed by great minds of the past and were simplified into tangible equations. So now as we commence our exercises we see that these Saxon math questions are part of an ancient dialogue. These questions have been asked, studied and answered for thousands of years. So "Why," our student wonders, "do we need to keep studying them?" This is an excellent time to look at some current scientific uses for which these theorems can be helpful. They include use of GPS, navigating in outer space and measuring areas of a building or bridge for the purpose of construction. Athena and I were recently purchasing tile for our kitchen. We went to several tile stores and were unable to determine the exact cost of the tile due to the lack of unit pricing. The salesperson was unable to provide us with a unit cost per square foot so that we could compare various prices of tile. After tap-tap-tapping repeatedly on her calculator she finally looked up sheepishly and said, "They just don't give us an app for that so I can't answer the question." Then she turned to Athena and said with a smile, "You see, that's why you have to study math in school." Athena just smiled back because she had already calculated the various sums in her head while pretending to study the ceiling. We left the store thanking Pythagoras and his ancient friends for enabling us to get an honest price quote. Expanding the relevance of an otherwise "dry"
subject takes a creative approach but makes it much more fun to teach and much more entertaining to learn. Where do we find our creative inspiration? We just keeping asking, "Why?" and "Who?" and "When?" each time we learn a new fact. Let Me Count the Days: Homeschooling is searching to find the past and the future while struggling to understand the present.